On January 10th 2006 an accident occurred in the product tanker Prospero due to failure of the vessel’s podded propulsor system. 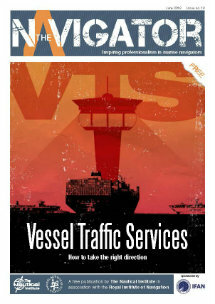 The incident took place at the Semlogistics Terminal, Milford Haven Wales, UK. As the vessel was approaching the No2 Jetty the podded propulsor system unexpectedly failed, resulting in loss of control of the vessel and subsequently its heavy contact with the terminals’ infrastructure, causing material damage to both the jetty and the vessel before control was regained. 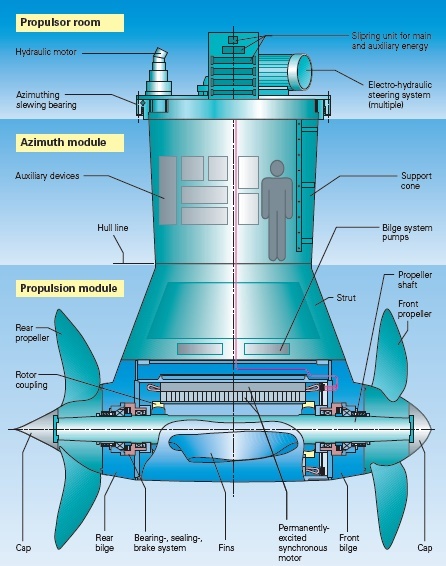 The SSP system was developed by the Siemens-Schottel Consortium(SSC).In this consortium ,Siemens was specializing in the power and propulsion motor equipment and Schottel was responsible for the mechanical aspects of the pod arrangement used to mount the SSP system. The SSP system is combining the functions of propulsion, steering and stem thruster into one unit. It is using a twin propeller combined with a hydrodynamically optimized propulsion module which includes a permanently excited propulsion motor. The twin propeller technology comprises two propellers on a common shaft. These two three-bladed propellers rotate in the same direction and are located in front and behind the propulsion module. This configuration has the advantage of sharing the load between the propellers with maximum productivity from both. Two fins mounted between the propellers on the propulsion module also increase the overall efficiency of the ship, along with the propulsor’s strut by gaining back the swirl energy. The diameter and weight of the permanently excited synchronous propulsion motor are significantly lower compared with conventional, electrically excited synchronous motors. It has therefore been possible to reduce the diameter of the propulsion module that accommodates the motor. This fact allows the reduction of the housing/propeller diameter ratio to 35-40% dramatically affecting the overall efficiency of the SSP Propulsor. Furthermore, the permanently excited propulsion motor itself is about 2% more efficient because there is no electrical excitation or associated equipment, and no external air-ventilation. According to its design, the motor needs no brushings, airings and ventilators. The controls of the SSP system are sited on the wheelhouse, engine control room and locally in the pod room. 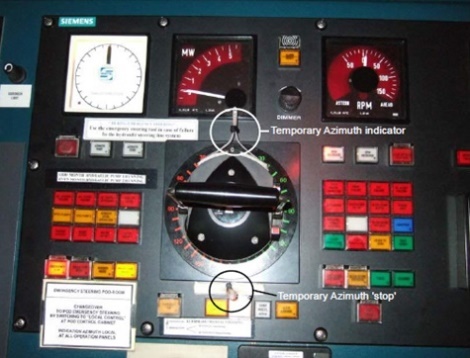 Regarding the wheelhouse controls, which are of particular interest for the accident being discussed, the primary control is by the “electric shaft system” a type approved item used by several manufacturers of propulsion systems, and the secondary via back-up a back system of push buttons controlling speed and azimuth. This system is selected either manually or automatically(when the primary control failed). The system’s alarm is both visual(flashing) and audidble. The visual alarm can be dimmed without affecting the audible one. At the time of accident Prospero was nearing an end of passage from Dublin. No tugs were ordered for the berthing operation. The master and a pilot were on the bridge. As the vessel approached the jetty, the master transferred the conning position from the centre to the port control console in preparation for berthing the vessel port side alongside. When the ship was within 100 metres of the jetty, at a speed of 1.2 knots with less than 10% power applied to the ships propulsor system, the master moved the control lever to increase the speed slightly in order to bring the vessel further ahead. At this point, suddenly and without warning, the control lever appeared to move to approximately 70% of full power. As the pod had been positioned to keep the vessel’s stern clear of the jetty, Prospero very quickly increased speed and her bow began to swing to port towards the jetty. The master then attempted to pull the control lever back to zero but the power remained at 70%. The vessel was now so close to the that impact occurred. Prospero’s stem landed heavily on the concrete decking at the head of the jetty, and shortly after this, the flare of the bow made contact with the steel gantry supporting the jetty’s oil loading arms. While the master was unable to control the pod’s power, he still had control of its direction(azimuth control), and he rotated the unit to move the vessel’s head to starboard and operated the bow thrust to push the vessel’s bow off the jetty. This action brought the vessel parallel with the jetty. However she was still moving ahead. The master now attempted to regain control by transferring control back to the central console and selecting the push button power control function, but this was not successful. He then ordered, on pilot’s advice, the vessel’s anchor to be let go and he turned the pod towards the stern to reduce the vessel’s increasing headway. This was particularly important as there was another tanker on the berth ahead, and Prospero was still under no control. Shortly after this, the power on the system dropped to zero, although the master did not recall making any specific control inputs. However, while the master was still evaluating the situation the power increased again to 70% and the vessel quickly accelerated astern towards the jetty. The master once again attempted to reduce power by pulling back on the control lever, but to no avail, and he then tried the push button controls again, also without success. The vessel was now proceeding astern, albeit with an anchor down, but remained out of control. The pilot warned the personnel on the jetty of the situation to ensure they were clear of danger. Shortly after this second, uncontrolled,propulsion, the vessel’s port quarter made heavy contact with the first of the mooring dolphins to the west of the jetty. 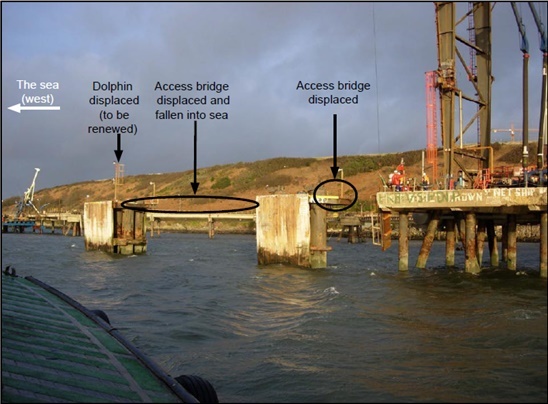 She then continued moving astern to also make contact with the second dolphin, resulting in significant damage being caused to both the vessel and the mooring dolphins. Following the second collision, the master telephoned the ECR agreed with C/E to attempt to regain control of the SSP by transferring the control position from the bridge to the ECR, and then immediately back to the bridge again, in an attempt to reset the SSP control system. This was successful, and the master was then able to use the normal control levers to stop the SSP and stabilise the situation until 2 tugs arrived of tugs to assist the vessel onto a suitable safe jetty. Despite the earlier control problems, the pod was used during this move and behaved normally throughout. After the accident, the SSP system control was checked by 2 specialized Siemens’ service engineers who found one loose wire on the starboard bridge loose control stand, which provided the supply for the electric shaft line motor for this control lever. Also, several other connections were found to be loose. The maker has stated that the loose cables were not the cause for the loss of control.T he cabling was provided and installed by the shipyard. A full power-on system test was conducted, without any apparent problem. The test included the transfer of control within the wheelhouse and manoeuvring from all wheelhouse control positions as well as back-up control buttons. 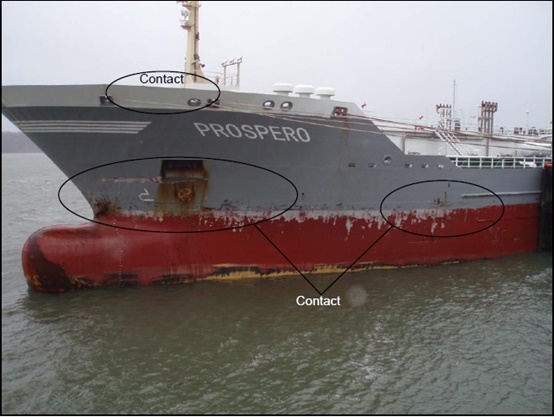 rospero’s problems with the podded propulsor control started earlier in 2006 when the vessel was eastbound in Gulf of Finland (on September 20th)and an alarm of pod control unit fault 1 and 2 was raised,rendering the pod control inoperative. Upon investigation, the fault was detected to be the device transmitting control signals from the turning pod to the control units(gauss). 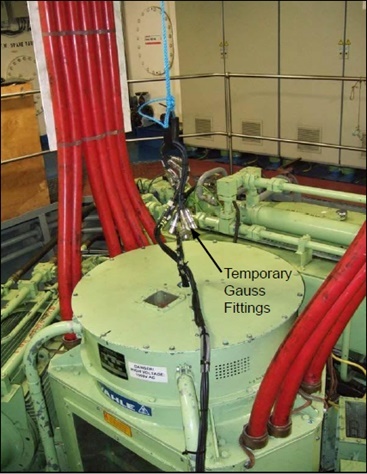 Short emergency cables provided as spares onboard were connected in order to by-pass the gauss thus making the manoeuvering possible though limited in terms of pod steering angle.Shortly after this,new four meter long cables were fitted by-passing the gauss but the original gauss was not repaired and not fitted back again to the vessel. This modification done created a limitation to the pod operation as it could it only be turned around 180 degrees(concerning only manoeuvring mode) due to danger the cables being then twisted and damaged in case of full 360 degrees turn. The control levers in bridge console, bridge wings and ECR console were fitted with mechanical stoppers in order to prevent the pod turning more than 180 degrees and signboards fitted besides all control positions. The root cause of the initial failure of the pod controls has not been found. However, it is suspected that out of range signals in the propulsion control system caused the system to automatically supplant the primary control levers with the back-up buttons. When Prospero’s primary propulsion control system failed, the master was not alerted to the failure because all the alarm lamps had been dimmed and thus he did not detect that the system had probably switched into a reversionary mode of control automatically. When built, Prospero’s propulsion system had been innovative, and the owners had benefited from an extended warranty. These two factors resulted in the owners depending heavily on the manufacturers for all aspects of product support. weak safety management system (SMS) and system documentation. For example even though a Failure Modes and Effects Analysis (FMEA) for the SSP system had been carried out by the maker(SSC) the document itself was not available onboard. nonexistence of dedicated technical standards by the classification societies and marine organizations for the system when it was introduced. It was only in 2006 when LR issued rules for podded propulsion units. It should also be mentioned that in 2003 a movement was made by DNV and a forum, consisting of the 3 major pod manufacturers (including SSC), named Pod Quality Forum (PQF) was instigated. Its aim was to improve pod quality and operational liability. The forum’s instructions were to be implemented as an industry standard by the pod manufacturers involved. The combination of the above mentioned factors, resulted in a vessel whose resilience to defects and emergencies was significantly weakened. The presentation of the alarms and reversionary controls on the SSP system could be potentially confusing to an operator who was not fully trained on the SSP system (for example the Master of Prospero). Prospero’s engineers had not received either general training (STCW) in podded drives, or SSP system specific training; none were specialist electro-technical officers. They were, therefore, ill-equipped to advise on system operation, or to oversee maintenance and defect rectification on the SSP system. The Dönsotank safety management system had a number of shortcomings which were not identified during routine Flag State audits. 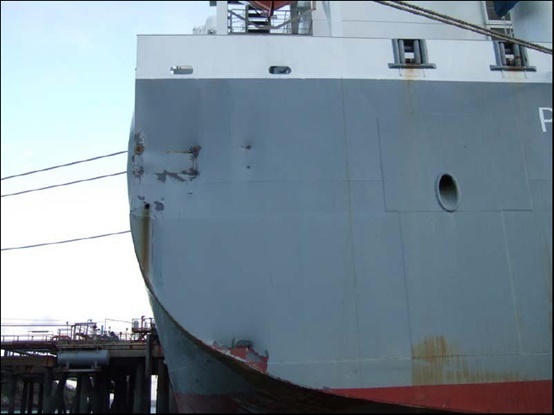 Better accident and reporting procedures following sister vessel’s Bro Sincero May 6th 2006 accident could have prevented the subsequent accident to Prospero. The manuals and documentation on board Prospero were inadequate to support the safe operation of the ship. Dönsotank ‘s shore staff had not received adequate training to support the operation and maintainance of the SSP system. This accident produced lessons learnt for all the stakeholders involved.The shipping company (Dönsotank), the SSP system maker (SSC-Siemens), classification society (DNV), the Milford Haven port authority and the charterer (Chevron). Added twice yearly PMS routines for the regular checking and tightening of cables in the SSP manoeuvring cabinets. Added Planned Maintenance System (PMS) routines for the SSP manoeuvring control levers. Implemented procedures within the SMS for the changeover to bridge wing control stands, to include function tests. Revised the pre-arrival checklist to include checking the wheelhouse alarm and control panel dimmer levels. Reviewed the bridge manning policy throughout its fleet to ensure that the bridge team consists of at least two competent persons for port entry and departure. Amended its ISM SMS to include instructions regarding the procedures required when cargo remaining on board is knowingly over-carried. These new instructions have been circulated to all of its tanker fleet. The Schottel pod system alarms were to be revised and routed to the alarm system of the PCS and the automation system; this revision was necessary to fulfil the requirements of the gauss transmitter FMEA. The propulsion converter controls and associated systems have been revised to ensure that if the converters shut down due to speed encoder failure, the propulsion control system changes over to the other speed encoder automatically. The automatic changeover from pod control lever to the back-up speed control buttons (in the case of setpoint speed failure) was to be cancelled, and revised to manual changeover after an alarm has been initiated. The alarm arrangement was revised and now included signals to both the SSP alarm system and the main ship’s automation system. The setpoint processing has been modified, the last setpoint was stored in case of failure. Agreed to offer Dönsotank a technical training package for the SSP system and ensured that a full package of SSP system documentation would be made available to Dönsotank with all documentation in English. Prepared the technical modifications to Prospero’s SSP system necessary to meet current class requirements. Agreed that the Programmable Electronic Systems (PES) within Prospero’s SSP system will be audited to the ISO document 17894:2005 or an equivalent classification society standard. Agreed to apply current standards to compile a revised FMEA for the SSP system on Prospero. The analysis of the system would include the human-machine interface. The verification process would include the trials and testing necessary to prove conclusions, to be approved by DNV. Agreed to circulate relevant safety critical information – “Lessons Learnt” among all owners/operators of SSP systems that are in service. Issued further survey memoranda and two conditions of class to Prospero; the memoranda required modifications to improve the SSP alarm system. The first condition of class requires significant alterations to be made to parts of the SSP power control system, in order to ensure that a back-up system is readily available at all times and to be capable of being put in to operation within 30 seconds. DNV also required that written procedures for dealing with a loss of steering and propulsion were to be established and regularly trained. The second condition of class suspended the class notation E0 (UMS) and so required that Prospero’s engine room be continuously manned; valid until the first condition is deleted. Issued an internal memorandum to its surveyors reminding them that when attending ships for the survey of casualties, they should consider all aspects of the incident within the scope of class involvement. Issued a memorandum detailing changes made in DNV’s requirements and procedures for approval, certification and installation and testing of pods and associated control/automation systems (Annex G). Proposed changes to their rules for the classification of ships that will improve the handling of changes to control systems on board ships in operation. Surveys of control and monitoring systems will be extended to include greater focus on how changes to control systems are handled. A “change log” will be kept by a responsible person on board the ship, the change handling process will become traceable. 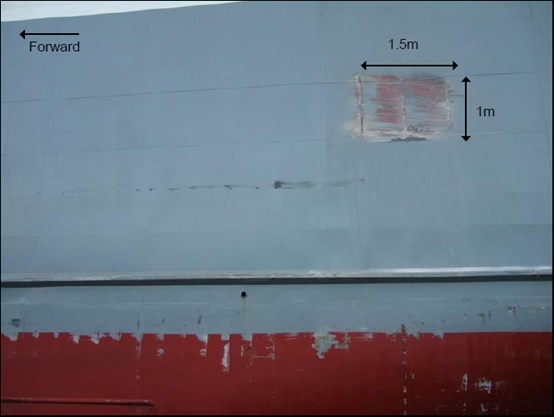 Reviewed the extensive investigation and testing on board Prospero off Simrisham (25 April- 1 May 2007) and consider this as a practical equivalent of an FMEA review for the vessel. Reviewed its guidelines regarding tug usage for berthing and un-berthing. 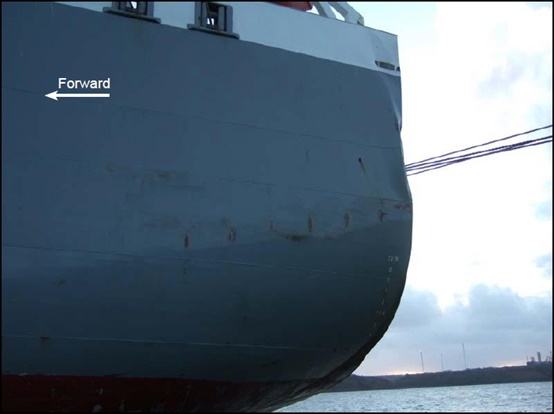 The revised guidelines clarify the process for tug allocation to tankers of all sizes using Milford Haven. Issued an operational memorandum, requiring that vessels new to the port and so not assessed previously by pilots, must be “flagged up” to the deputy harbourmaster. This will highlight visits by new-build vessels, including those using new propulsion technology. Declined to charter Prospero and her sister vessels again until report of MAIB has been published and until such time that it is content with the risk reduction measures applied to the SSP ships operated by Dönsotank. Finally it should be mentioned that despite all the measures taken and described above, the pod system was responsible for another accident in Prospero the following year when on April 23th 2007 , at St Petersburg channel, Russia the vessel lost pod control (the SSP unit was not able to hold azimuth-rudder angle position) and eventually grounded.